This is Part 2 in a series of stories (and tips) from our most recent road trip. Read Part 1, on the Calico Ghost Town, here, and Part 3, on the road to Flagstaff, here. TRAVELING WITH KIDS TIP #4: Plan your meal stops ahead of time, at places where you would want to stop and look around anyway. If you wait to stop until you are all hungry, your choices will be limited to whatever truck stop restaurant happens to be open at the next exit, because when the kids get hungry, they stay hungry. And loud. And if that restaurant is terrible, or even worse, closed, you will all be miserable. We rolled into Vegas just before dinner time, and checked into our hotel (another free night at an Embassy Suites because of points). We had decided to stay off the Strip, mostly so we could get another two-room suite instead of trying to crowd into a casino hotel room. We chose a hotel near the convention center, and it happened to be just a few blocks from a monorail station that connected the convention center to all the hotels on the Strip anyway, so we didn’t have to worry about driving around in Vegas for the night. We ate some dinner, then headed down to the hotel pool. The pool experience was a little underwhelming. It was advertised as heated, but it was cold, and Adrian had to get out after a few minutes. (Erin, though, my little fish, jumped in and out of the pool for half an hour, leading a band of new best friends in her pool shenanigans.) I went outside to the hot tub, where I soaked as setting sun reflected off the casino towers in the distance. I hoped to bring Adrian in with me to warm up, but just as the pool was too cold for him, the hot tub was too hot. We left a little too soon for my soaking body’s liking. 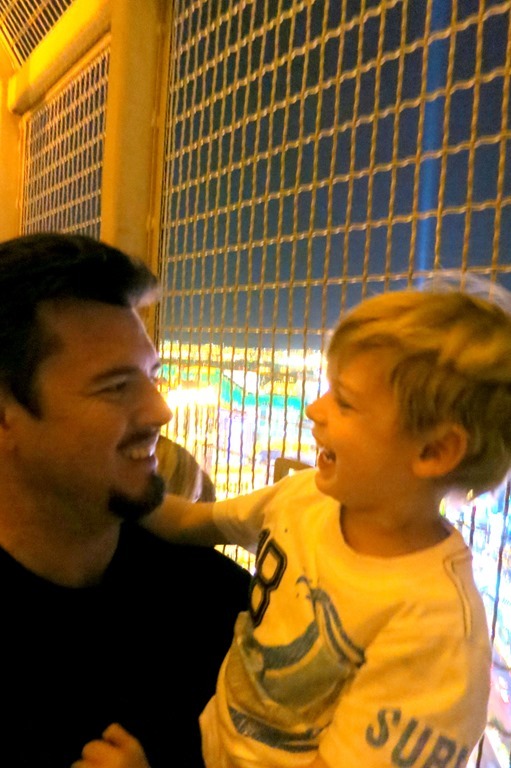 Since we had the kids with us, we weren’t going to be doing much gambling, or drinking, or clubbing (so, none of the things people tend to go to Vegas to do), but we had all night, and all of the next morning to find things that would be fun for them, and for us. The first thing we decided to do was get a nice view of the Strip. So we took the monorail from the convention center down to the Paris Hotel. 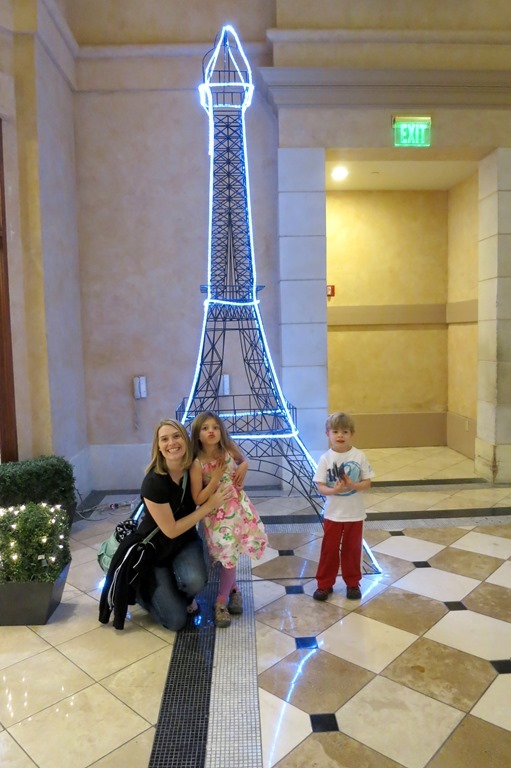 We walked through the casino (as smoky as I remember casinos being), and then went up to the top of the replica of the Eiffel Tower that is built into the side of the hotel. The view from up there was pretty great. I’ve been up to the top of the Stratosphere at the end of the Strip, but I don’t remember if its view is much better. The kids found a telescope someone had put some quarters into, and they spent some time looking down at the buildings, and trying to get a peak at “the castle” down the street. After that, they thought all the telescopes were free, so they went round and round at the top of the tower, checking all of them. Eventually I distracted Adrian with some picture taking. Although the view is nice, the line to go up to the top of the tower is long and slow-moving. It’s also not a free trip, and there isn’t much to do once you’re up there except look around at Vegas. When we came back down we decided to change tactics. TRAVELING WITH KIDS TIP #5: No matter how cool you think something is, your kids will disagree, so don’t blow your budget on experiences that you think they SHOULD have when you can get by with the experiences they CAN have. Maybe you’ll have money left for the experiences you both WANT to have. The first thing we did when we came down from the tower was to get some ice cream. The kids had been up late the night before, and we were okay with them being up late this night, our only Vegas night, too, so the sugar rush wasn’t a concern. Also, punctuating an experience with ice cream is nice, and it was an indulgence in a city full of indulgences that we were otherwise avoiding. Next, we walked across the street to the Bellagio hotel. This took longer than that sentence would indicate. The press of people outside on the Strip on a warm Spring evening was impressive, and we had to walk down the block a bit, with all of those people, to get to a crosswalk. Oddly, it was outside the casinos, rather than inside, that we were most challenged to shield the kids from the seedier side of the city. Up and down the sidewalk were the club-and-services hawkers, handing out small cards or flyers depicting Vegas’ promises. Sensibly, whenever a hawker would see a kid coming close, he would pause in his hustle, and we were never offered a card or flyer. But they were all over the ground, and Erin at least was curious when she caught one out of the corner of her eye. Emily quickly ushered her onward. Stationed right at the crosswalk, two young women in their best showgirl regalia posed for pictures with tourists walking by. I thought about getting the kids to take pictures with them, but the thought of a very complicated conversation about what they were doing and why they were dressed that way deterred me. It probably would have been a great scrapbook picture, though. 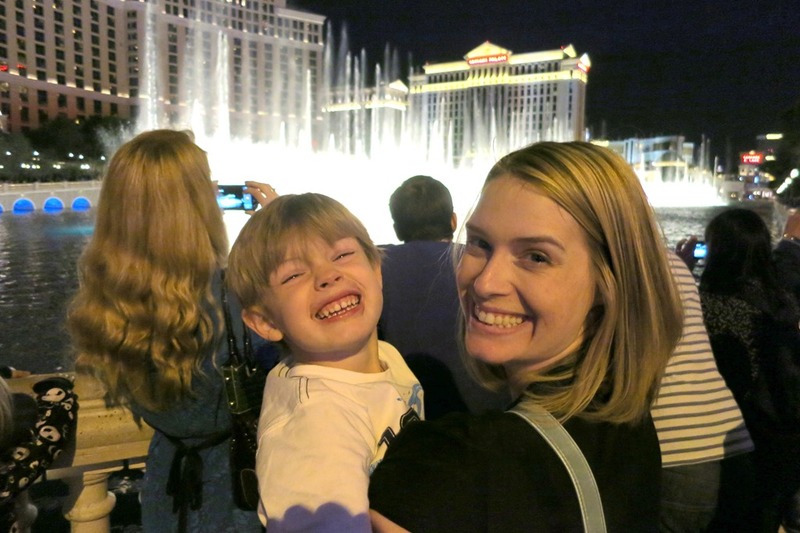 When we made it across the street to the Bellagio, we settled in with our ice cream for the world famous Bellagio fountain water show. The show only lasted for a couple of minutes, but the kids loved it, and it was free, so I have no complaints. We slowly made our way back to the monorail station, and eventually back to the hotel where the kids promptly fell asleep. Considering they had awoken in Bakersfield that morning, and all the things they’d done in one day, I didn’t blame them. The next morning we had breakfast at the hotel instead of buying it at a restaurant, then we packed up the car and checked out. We had to get to Flagstaff, Arizona, but we weren’t in any hurry to leave Las Vegas. 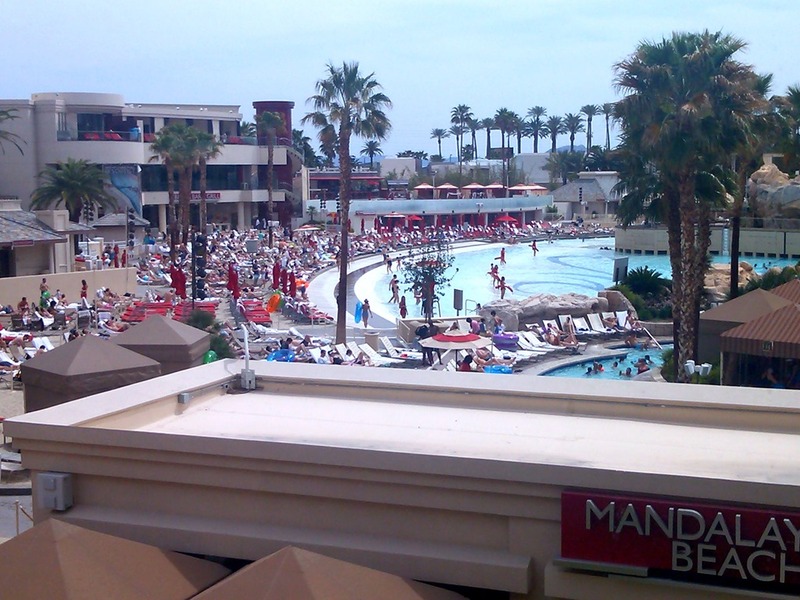 So we drove down the Strip to the Mandalay Bay Hotel, parked the car, and went inside. As we were planning the Vegas stop on our road trip, we had considered a couple of things the kids might like to see. One was the zoo at the Mirage, where Siegfried and Roy kept their white tigers. The other was the aquarium at the Mandalay Bay. Since Adrian was weeks deep into an obsession with the Octonauts, we decided to take them to the aquarium, Shark Reef. The aquarium isn’t large, especially if you’ve spent any time at the Monterey Bay Aquarium, but it is a bit larger than San Francisco’s Aquarium of the Bay (though it only has one tunnel to walk through beneath the aquarium). 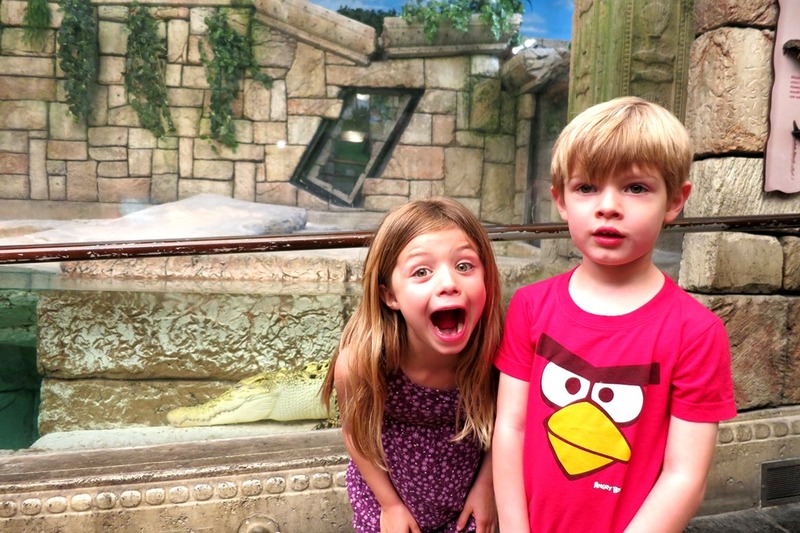 The kids saw giant lizards, crocodiles, sharks, Amazon River fish, and an octopus. 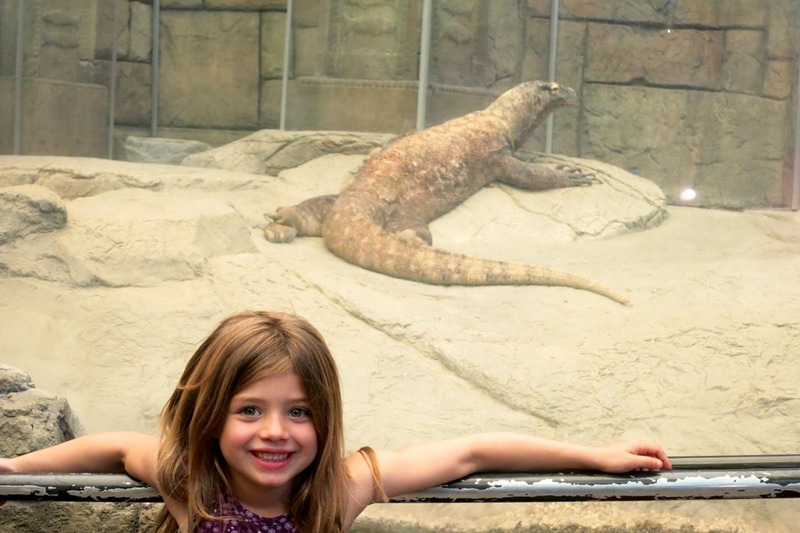 It was perfect for the amount of time they were willing to spend at an aquarium that morning, and for the amount of time we we willing to stay in Vegas before getting back on the road. The last thing we did before leaving the hotel to get on the road was grab some lunch. We ate from the deli case of a casino restaurant, sitting around a table in a lounge just off the casino floor that, from the look of it, would be filled with music, and drinking, and dancing later that night. For the time being it was just filled with us. Then, onward to Flagstaff! TRAVELING WITH KIDS TIP #6: If you are getting on the road in the middle of the day, right after lunch, make sure to grab something for lunch that will keep, is portable, and won’t contribute to the mess in the car. For instance, a sandwich container makes a great bowl for fruit or crackers in the car later, while hummus and pita chips will make you want to get the car detailed after the kids smear it all over their chairs. It also smells up the joint. Think about your noses. 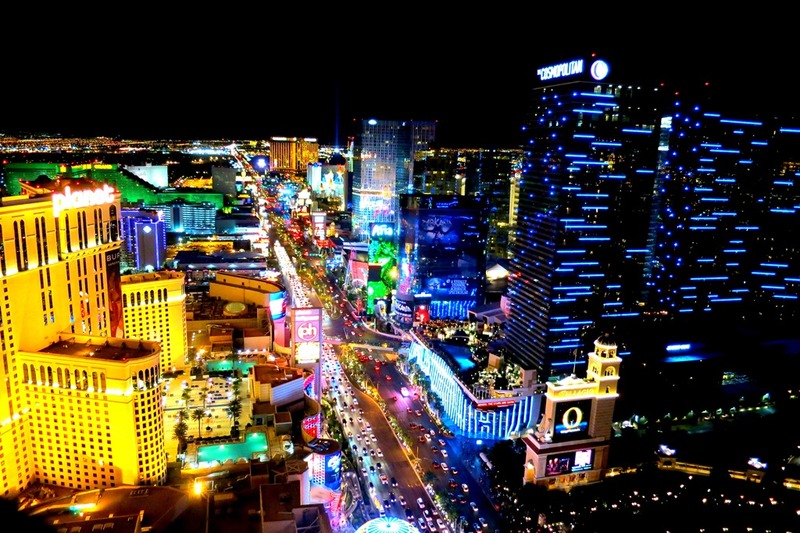 We are headed there next Friday for our own Vegas with kids trip. Thanks for the tip about the seedier elements on the street! I never would have thought about that! There is skin everywhere you look when you’re outside. It’s better in the casinos, although there are a lot of posters up for burlesque shows that might take some explaining. I lived in Vegas for five years. Surprisingly there is a lot of family stuff to do there. Looks like you had a fun trip!